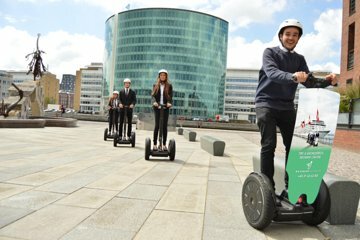 Save time and foot fatigue on a Segway tour of Copenhagen, zipping between attractions such as the Little Mermaid, Frederik’s Church, and Nyhavn while still enjoying a close up look at these iconic landmarks. Enjoy the more personalized experience of a small-group tour, benefiting from provided headsets to clearly hear insights provided by your guide, and rehydrate with a complimentary beverage at the conclusion of your tour. Operates in all weather conditions, please dress appropriately. In winter months or cold temperatures, warm clothes and gloves are recommended. We reserve the right to cancel the tour in extreme weather conditions and will aim to rebook you on next availability. Please arrive at our store 15 minutes before the tour departure time for check-in and training. We will try our best to accommodate latecomers to the next available tour but we cannot guarantee availability, in which case you will be charged in full.